RUSAPE, Zimbabwe, May 7 2018 (IPS) - Every year, Amos Chandiringa, 43, a farmer in Nemaire village in Makoni district in northeastern Zimbabwe, laboriously waters his tobacco nursery with a watering can. The toil of the job often leaves him without the energy or time to do other household chores. “I live near a dam, so I’ve access to plenty of water, but I cannot do much with the water because I lack the necessary technology to mechanise my farming. Installing an electric or diesel water pump have been options, but that is expensive,” he tells IPS. Government, solar last mile distributors and development agencies say using solar electricity to power irrigation pumps, process harvests and for preservation of crops can transform rural lives. In February, Chandiringa was privileged to host a combined farmers’ field day and solar fair at his homestead for the first time in his area and in the history of his farming career. Solar entrepreneur Isaac Nyakusendwa says farmers like Chandiriga could make light work of their farming and multiply their yields if they used solar pumps to draw water from the dam to irrigate their crops or to use in the home. Although farming is the occupation of most people in Rusape and other areas of rural Zimbabwe, the usage of solar photovoltaic systems remains limited mainly to lighting and entertainment. Government, solar last mile distributors and development agencies say using solar electricity to power irrigation pumps, process harvests and for preservation of crops can transform rural lives by providing better crop yields, higher incomes and reducing the physical labor of farming. Nemaire councillor Sam Maungwe says farmers in his area earn good money, mostly from tobacco farming, but due to poor knowledge of solar technologies, many of them spend their earnings on radios and household furniture. 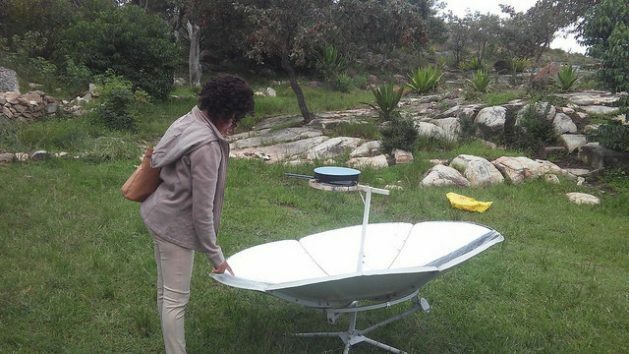 Petronella Karima, an extension officer, says there should be more platforms to educate rural farmers and expose them to new, affordable technologies because most of them are not aware of the capabilities of solar products. “Many use solar for entertainment. Some have big solar home systems in their homes, but they don’t know that they can use it to water their crops and install water in their homes. With the knowledge they got from the solar exhibition, I believe many will now use solar to irrigate their crops and to harvest water,” Karima says. Chiedza Mazaiwana, the Power for All Campaign Manager at Practical Action Zimbabwe, says awareness of renewable energy solutions is relatively low, with market penetration of solar lighting and home systems estimated at only 3%. She says consumer literacy on renewable energy products is critical in unlocking the huge potential of renewable products in off grid rural communities. “Lack of knowledge is a major barrier to the development of the solar market. Most potential rural customers are unaware of recent advances in solar technology, reductions in the cost of the technology, availability of financing solutions such as the pay-as you-go (PAYG) model that allows them to access technologies and products that would ordinarily be beyond their reach,” she adds. The past distribution of poor quality products and installations have also undermined trust and reduced demand, making it very hard for businesses to establish a presence in rural areas. However, as part of a rural solar market development effort, government, renewable energy firms and development agencies are concertedly using field days and solar fairs to encourage the use of solar energy as a way of improving livelihoods in rural areas. Solar fairs are emerging as a key platform for awareness raising and consumer education on solar for off-grid communities and for solar distributors to create business linkages with farmers. Other methods include media campaigns and the use of trusted opinion leaders such as chiefs, head teachers and faith leaders to spread the word about the novelty of renewable energy solutions. This method has proved particularly effective in East Africa. He says the PAYG model allows the farmers to pay a nominal deposit for a renewable product of their choice, and finish the payment in small, cheap monthly instalments. During the fairs, young males and females have been particularly attracted to solar powered lighting, entertainment and communication gadgets while women liked solar cooking stoves and older males got attracted to water pumping systems. Practical Action’s gender officer Tony Zibani says the use of solar technology can ease the triple burden of work on women and reduce gender-based violence in the homes as chores performed by women would be lessened by technology. Over 60% of Zimbabwe’s population do not have access to energy and rely on solid biomass fuels such as firewood, charcoal and kerosene as their main cooking fuel – solutions that are expensive, unreliable and environmentally unsustainable. While the demand for energy in rural areas is increasing, the provision of electricity is skewed greatly towards higher-income households and urban areas, leaving out a large proportion of the rural population. Mazaiwana asserts that decentralized electrification solutions are the fastest, most cost-effective and sustainable approach to universal energy access, in addition to providing economic opportunities for communities.